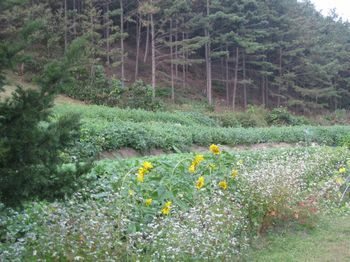 The Yatoo Nature Artist’s Association has a residence at Wogol about 45 minutes from Gongju and set in a valley where local villagers grow rice and market garden vegetables. 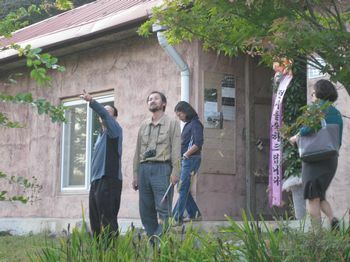 6 artists can stay at the residence for a period up to 3 months There is also the opportunity to run workshops involving people from the local community. The day of our visit we stopped in the village to be introduced to the elders. The people are gentle and welcomed us warmly. The land in the surrounding country appears lush and all manner of plants are growing. 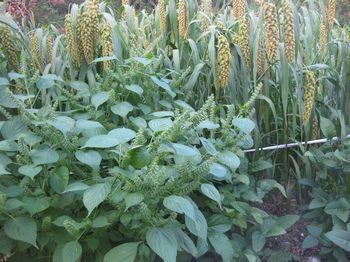 I have seen sesame plants and have even eaten the leaves of the sesame plants in a Korean restaurant. I have also tasted fresh kimshi and 12 month old kimshi and enjoy the sharp, spicy taste with most meals. Wandering around the spacious grounds I came upon art works tucked in secluded areas of the garden or taking centre stage on the lawns. Some of these art works and others in the Nature Art Park lead me to thinking about nature and art. It is possible to see ‘natural’ at one end of a continuum and ‘artificial’ at the other end. A sunset is not art, it is a natural phenomena, where as a picture of a sunset is an artificial representation of it. Rather than capturing nature on canvas or on film, Nature art proposes that art be site specific. Using the attributes of the site in an artful way the aim is to focus attention on the natural environment, its beauty, its complexity it fragility, its power. I am still coming to grips with this residency. Used as I am to making objects it is a challenge for me to do a simple thing like stacking few stones on top of each other or tying a few twigs together and thinking that is enough. OK. Less is more, I know. Now is the time for me to put it into practice!